New Sligo Rovers signing Patrick McClean pictured alongside manager Gerard Lyttle. Former Derry City defender Patrick McClean has signed for Sligo Rovers. The centre-back was involved in the Waterford squad, which defeated City last weekend in the season opener at the RSC and he incredibly now has a chance to see off his home town club with The Bit o' Red. McClean has signed a two year deal with Rovers. Sligo boss Gerard Lyttle is delighted to have signed the 21-year-old, after keeping an eye on him for a number of years. "He had been with Derry and the season with Waterford has brought him along further. I was trying to sign him at Cliftonville when he was at Derry and I've been tracking him since. "Kevin Deery has been monitoring the situation in the last few weeks and I don't think he fully settled down there. It's a long way from Derry and that was a hindrance to him. We tried to get the deal done last week but it took time. 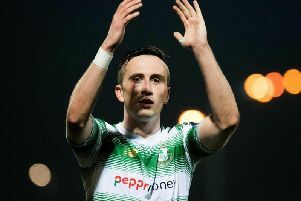 "He was in The Showgrounds last Saturday night to see what the club is about and I think it impressed him. He has made a sacrifice to come here this season - this is a good deal for the club for a player of his calibre. "He is a centre-half but can also feature at left-back. When we have a full hand defensively, it's going to be hard fought to get in the team and that's brilliant for us. "Patrick offers a goal threat at set pieces. We didn't look the biggest of sides against Limerick and that's another positive in him joining us. It's a big addition."